Do you get annoyed, when it rains or there are autumn leaves on the ground, that your railway station becomes polluted by so many posters and announcements advising you to watch your step, and warning you about the “event of weather”? I imagine Simon Jenkins must get very irritated. In his latest drivel for the Guardian, Jenkins tells us that it’s impossible to make travel “safe”, and we shouldn’t try. He cites the example of the Santiago de Compostela train crash, in which 79 people died last month. An accident, which nobody intended to happen, and for which it would “not be sensible” to “seek fault”. We must accept that accidents will happen, Jenkins tells us. Slips, trips and falls and catastrophic high-speed train crashes are inevitable, and if we try to stop them, we might merely make the problem worse. The same is true on the roads, he says, where reducing regulation, sharing space, and replacing instruction signs with ambiguity empowers road users to take more care. But, as seems to be a habit, Jenkins rather picked the wrong example to prove his point. There’s a reason why I mentioned those apparently inane announcements about being careful not to trip over, and there’s a reason why our stations have become polluted by them. Slips, trips and falls now account for a majority of the serious injuries to staff and passengers on Britain’s railway, and resulted in half of the deaths in the 2012/13 operational year. Think about that for a moment. A transport network carrying 1.5 billion passenger journeys at speeds now up to 140mph in vehicles with stopping distances measured in the kilometres under high-voltage power lines on complex tangles of steel rails over thousands of bridges and viaducts, all of which requires constant maintenance by a massive workforce using huge arrays of heavy machinery. And the biggest cause of serious injury and of death (aside from suicides and trespass) is falling over. 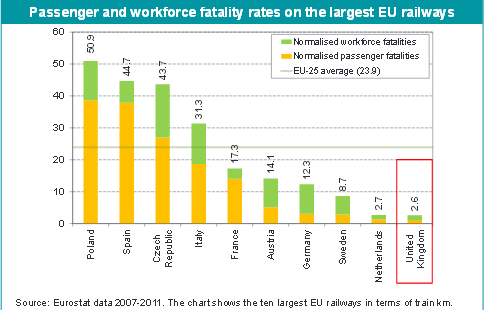 Four passengers died on the railway in 2012/13, and two members of staff died — though as with the single workforce fatality in the preceding year, one of those was in a motorway car crash on the way to a work site. 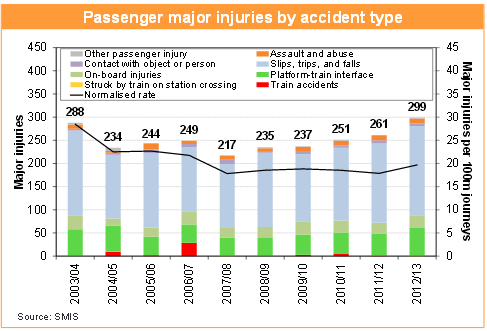 The passenger fatalities were two trips, an assault, and one death at the “platform/train interface”. That is, two thirds of the fatalities on the railway had nothing to do with actually being on the railway, and could as easily have happened on a walk in the park — in fact, are probably more likely to happen on a walk in the park. The fact is, far from accidents being inevitable, the Santiago de Compostela crash couldn’t happen here. Our signalling systems alone, not to mention the wider railway system and culture of safety, would not have allowed a driver to let his high-speed train travel so vastly overspeed into such a bend. That’s the exact sort of signalling that automatically protects and stops trains that Jenkins warns us against. And it works. Far from the 79 or more fatalities that Jenkins’s “safety systems are dangerous” thesis would predict, last year was the sixth consecutive one without a single fatal train crash. Zero people have died in a British train crash since a Glasgow-bound Pendolino came off the tracks at ill-maintained points in Cumbria early in 2007, resulting in an impressive back-flip by the lead car and a tumbling slide down the embankment by those following. And, astonishingly, just a single fatality of one elderly passenger, thanks to the strength and safety engineering of the modern carriages. And as is always the case when there’s a British train crash — or even just a (not so) near miss — a thorough investigation followed, lessons were learned, investment was made in new technologies and working practices were revised to ensure that nothing like it could happen again. Stopped clocks and even Simon Jenkins are right sometimes. We can learn a road safety lesson from a train crash. It’s just the exact opposite of the one Jenkins suggests. Accidents don’t just happen. We can stop them if we have the will. This entry was posted in Uncategorized and tagged rail, road danger, road safety. Bookmark the permalink. I think there’s something to learn for cyclists from why driving a car here is relatively safe (though much less safe than train travel) – it’s not inevitable, I believe that driving a car in France is more dangerous in terms of KSIs/km than riding a bike here. The UK, along with Sweden, Switzerland and Japan, is the safest place in the world to drive. Why? It’s not because the cars are safer, because they’re the same everywhere (the helmet argument). I don’t know the evidence but I’m sceptical that it’s down to driver training and civility (the Bikeability/Cyclecraft/NiceWayCode argument). It may be down to congestion keeping down speeds and keeping up concentration – it’s hard to get up to fatal accident speed in a UK city, and it’s a lot easier to fall asleep on the motorway in France (the safety in numbers argument). Or it may be (like rail safety) because of a steady engineering out of adverse cambers, tricky bends, bad vision at junctions, tempting but dangerous overtaking spots, and the use of speed cameras (the infrastructure argument). I’d be interested to know if there’s any work been done on this. With regards to France, it is noticeable safer to be a cyclists in France that it is in the UK. 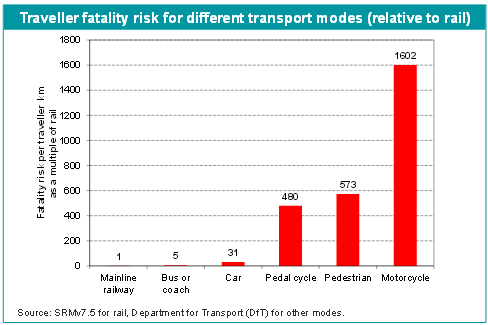 Just compare the fatality figures for London vs Paris for 2011 (the last year I know): London 16 – Paris 0. The reason? In no small part French law, the strictest Strict Liability in Europe, drivers must give cyclists 1.5 m, a zero tolerance of speeding (1 Km over the limit and you are prosecuted, no 10% leeway) and drivers are required to carry their own breathalyser kit. These laws have been passed in resent years with the express intention of bringing down the death rate. Here pedestrian and cycle deaths as considered as collateral damage, just “the price we pay for mobility”, “it was use an accident, it was unavoidable” or the cyclist would have lived if they had been wearing a helmet, as if it was the victims fault for being hit in the first place. Until that changes we will continue see deaths on the roads. I just looked at the guardian piece, and just as I suspected, it was an oversimplified, misunderstood and over-applied version of one of John Adams’ strands of thought. I don’t think JA is suggesting that safety measures never do any good, or never make things safer. I understand him to be saying that it is impossible, in principle, to predict every single set of circumstances that can possibly occur which might lead to an accident (because there are a practically infinite set of chains of events which could occur), and that the attempt to do so can be counterproductive. He combines this with observations about the way individuals manage their personal risk (i.e. we all take some risks, however mild) and risk compensation. Tbh, although I find this stuff very interesting intellectually (and I do count Adams as someone who has influenced the way I think about certain things) I’ve come to think that the oversimplication and misunderstanding to which it is inevitably subject renders it, well, somewhat unhelpful. Jenkins’ misunderstand was innocent – others, maybe not so much. This is Simon Jenkins, isn’t it? He edited the Times in the early 1990s when that paper promoted the theory that HIV does not cause AIDS, thus contributing in a small way to the deaths of thousands of people. Well said psychobikeology: Jenkins takes a particular slant on what Adams/Wilde and some others (including, in a modest way, myself). Re: David: the reason for lower KSIs per head of the population is due to a higher level of congestion intensity in a higher density network. The official reading of this is the smaller number of junctions, for risk compensation theorists like myself it is because of the greater need to watch out . Also there are wider national cultural attitudes to risk taking. As Adams and others show, risk compensation is stressed by people from different 9and opposing) political views. So Jenkins the car freak relies on it – but he is also good on opposing cycle helmet advocacy. People like me stress risk compensation to show how ‘good’ cyclist and pedestrian casualty numbers are often associated with pedestrians and cyclists having fled from a hazardous road environment; how crashworthy cars and idiot-proofed (for motorists) highway environments have exacerbated careless driving etc, etc. Excellent post. The railways are also heavily regulated – the Office for Rail Regulation is the independent body overseeing rail safety and ORR is very proactive on prevention as well as enforcement. There is also the Rail Accident Investigation Branch which investigates when things go wrong and looks at what went wrong rather than looking at blame. Highways have nothing which come close. The Heath & Safety Executive are only interested in those killed or injured at work and rarely gets involved in individual RTCs and the police deal with potential criminal acts. We need a RAIB for the roads and HSE need to look more at work related RTCs – what about HGVs vs cyclists? Over-speed de-railments do happen on British railways most notably on the Morpeth curve. Not in recent years, that I’m aware of? As I say in the original post, the safety culture of the British railway is something that developed very quickly and relatively recently, after the catastrophes of the Railtrack era. And perhaps still could happen in some locations where the risk hasn’t yet been identified, understood and mitigated. But the point is that those risks are these days constantly, systematically and systemically, designed out, and the incidents that used to happen no longer do.